Latest hit on the terror group by international coalition designed to dry up its primary source of revenue, UAE says. The United Arab Emirates said Saturday its warplanes had carried out raids against oil installations held by the Islamic State group, which controls large swathes of Iraq and Syria. The state news agency WAM did not say where the raids struck, only that UAE fighter jets took off overnight Friday from their base in Jordan, another partner in the US-led coalition against the jihadists. "UAE Air Force F-16 squadron deployed to an airbase in Jordan conducted fresh air strikes last night against the terrorist organization (ISIS)," WAM said. 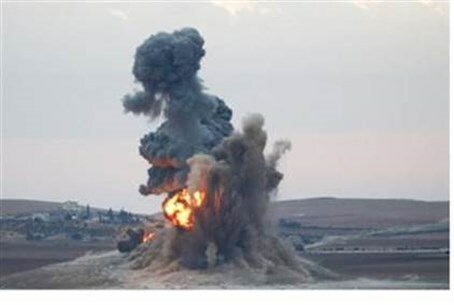 The planes hit several ISIS "operation and extraction points along crude oil pipelines in order to dry up the terror group's sources of funding", it said, adding they all returned safely. It was the second reported air strikes by UAE aircraft since February 16 when warplanes from the Gulf federation also took off from Jordan and hit oil refineries held by ISIS. The location of last month's strikes was not specified either. The UAE suspended participation in the US-led coalition against ISIS in December amid reported differences with Washington on ways and means of rescuing downed coalition pilots. But it resumed air strikes in February and deployed a squadron the F-16s to Jordan after jihadists murdered a Jordanian pilot captured in December when his place went down over Syria. ISIS released a video in early February showing the burning to death of Maaz al-Kassasbeh. Coalition strikes have frequently targeted oil facilities run by ISIS which has made huge profits from illegal oil sales. A UN report in November estimated that ISIS was earning between $850,000 and $1.6 million daily from oil sales.